In the above video, Stephen A. Smith and Skip Bayless debate whether or not LeBron James should be influenced by Magic Johnson’s $1 million offer to participate in the dunk contest. I am a fan of the NBA. 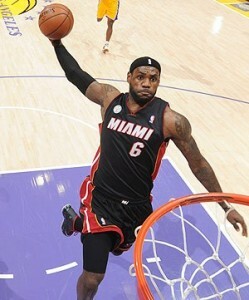 Obviously, I would love to see James throw down his vicious dunks in the contest. But James has turned down the opportunity for 10 years now. I think it is about time we all accept the fact that he just doesn’t want to participate in the dunk contest. We get so caught up in what we want these athletes to do or how we want them to act that we forget that they are people too. They have their own preferences and behaviors. It is perfectly acceptable for them resist the public’s wishes. How would you feel if someone else dictated your whole life? Let’s all stop whining and just move on. The dude doesn’t want to do it. It isn’t the end of the world.